It’s easy to look at the problems of the world and think that one person couldn’t possibly make a difference. War, terrorism, drugs, crime, homelessness, unemployment, millions of refugees, poverty, man-made climate change, the list of massive global issues goes on and on. And I’m not always sure where to start or even if I should bother trying. Then I remember well-known people like Gandhi, Mandela, Luther King and Mother Teresa and I know that one person can make a difference. But surely they were the exceptions. They were extraordinary people for extraordinary times, I’m not like that. And then I read about ordinary people. People like Jadav Payeng, who single-handedly planted an entire forest and regenerated an eco-system. People like Dashrath Manjhi, who carved a road in a mountain to give his village access to better services. People who saw a problem. People who used their skills, experience and passion to deliver a solution. People who made a commitment to making the world a better place. Next post – Are You Avoiding or Embracing Uncertainty? 🙂 Would love for the kids to read this too. pretty amazing what just one person can do. 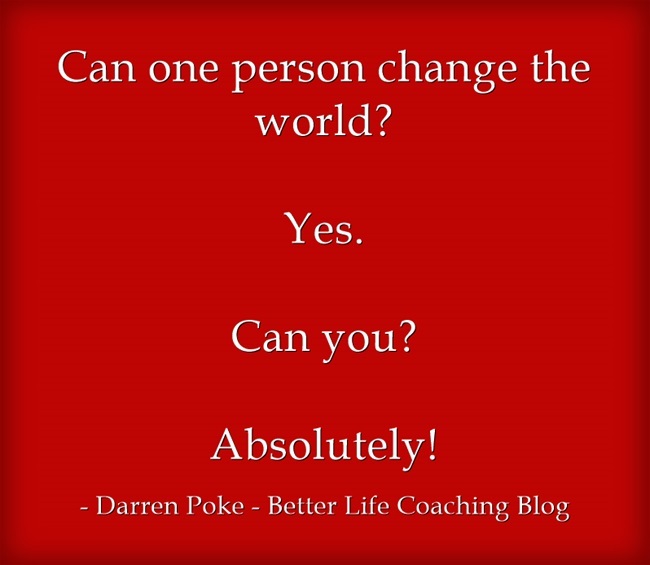 Yes one person can change the world, it may not get widespread media coverage, but every day people are changing their world and the world for those around them. I think one reason why we are all so different is so we can respond to different problems that need fixing. Martin Luther King wouldn’t have planted that forest like Mr. Payeng, because that was not his interest. You don’t have to fix every problem, focus on your interests and work on that. Ah ok then please do tell me how I could save EVERY SINGLE ANIMAL’S (non-human) life on this planet?? Or at the very least every non-human mammal’s life! I don’t think even Bill Gates would have that much money let alone me … but that’s exactly what I want to do, I just don’t think that’d be possible.